After the end of the war the housing problem in the Netherlands was the ‘number one enemy’. In the early 50s Nieuwenhuys was seeking for new pathways in which art could contribute to reconstruction of the post war Europe. He envisioned an art that was at once “lyrical in its means and social in its very nature” (1956). That period of time was crucial for Constant. After the Cobra period, Constant Nieuwenhuys’ work becomes more abstract. It develops more and more towards spatial experimentation and architecture. He starts to study architecture with the books of Aldo van Eyck. During that period Constant comes up with the question of how the construction of a city contributes to the quality of life. He starts to realize how the modern structures that surround us influence us. Before that, in the Cobra time he focuses on collective art and rejects individual art, now he goes even further by striving for a synthesis of arts. He tries to break the boundaries between art professions like painting, sculpting, architecture and technology, he feels like they need to be eradicated. In this period of time Constant is searching for artists with the same views as him; he works together with architects like Gerrit Rietveld, Aldo van Eyck and Stephen Gilbert. (Symbolic Representation of New Babylon), 1969. The exhibition “Constant. Space + Colour. From CoBrA to New Babylon” at the Cobra Museum in Amstelveen, showed that development of Constant’s work. Constant worked together with many different artist during his life and was not afraid to experiment with his style and way to approach his work. He both painted, made sculptures and made graphic work. It was very clear when you walked through the exhibition at the Cobra museum that his main approach have been space and colour during his lifetime. 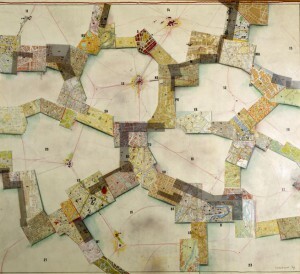 Constant’s development from Cobra to New Babylon was told by a narrative and you were guided through the exhibition that represented both his avant-garde experimenting paintings and his urban architectural sculpture work. Shown at the exhibition was this one video installation called Gyromorphosis which is made by Hyman ‘Hy’ Hirsh. Most of the works in the exhibition were presented live as maquettes whereas Gyromorphosis was the only digital piece that displayed the New Babylon ideas not by Constant himself, which was attention grabbing. Hirsh was born in Pennsylvania in October of 1911 and was an American photographer and experimental filmmaker. He was also one of the first filmmakers to use electronic imaginary. From looking at more of Hirsh’ work it is possible to make a conclusion that he treated films as malleable objects by constantly editing and re-editing them, mostly using live music instead of pre-recorded soundtracks. Hirsh did in fact dedicate himself to working with the describing form as seen in his other works. In Gyromorphosis,which he made while staying in Amsterdam, Hirsch strives to display the kinetic qualities of the New Babylon structures of Constant Nieuwenhuys. One by one he puts parts of the structures in motion and films the details with colored lighting having them overlap each other, appear and disappear. He creates a sensation of acceleration and suspense suggested by the work itself. He uses music from the Modern Jazz Quartet which becomes a great part of the piece; rough and blunt shapes together with very soft sound creates a great contrast that is hard to miss. Hirsh works with the describing form, which is a way to represent the weight and space of sculptural form on film.”To realize this aim I have put into motion, one by one, pieces of the sculpture and, with colorued lighting, filmed them in various detail, overlaying the images on the film as they appear and disappear. 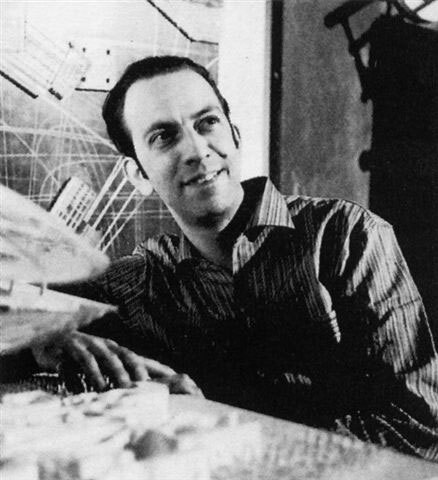 In this way, I have hoped to produce senstation of accelaration and suspension which are suggested to me by the sculpture itself.”, says Hirsh. (note by Joost Rekveld). It is a way to describe in moving images what is fundamentally still. You might say that a sculpture is described by the space around it, described by the the experience or the touch. The moving image places the viewer in another position and remove the viewer from the direct and individual experience. The individual sense of the material, surface and environment that you experience during a first hand encounter with a sculptural form is now in the describing form framed through the lens of a filmmaker. It’s a document caught in another time and scape than the one you experience yourself in front of the actual sculpture. It is in the tension between these two states that avant-garde filmmakers, and the artists themselves, have brought their singular and experimental approaches to filming form. 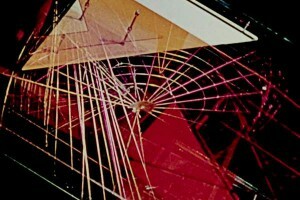 Another artists, who actually have worked with dynamic videos of this kind as well was László Moholy-Nagy, who while working at Denham studios created kinetic sculptures and abstract light effects. Artists present new ways of using the moving image to offer other and different perspectives on sculptural form. Spending a lot of time thinking about the principal behind the idea of putting Hirsh’ work in the New Babylon we have decided to look for a direct search of answers (contacting the curator of the exhibition). Thanks to Laura Stamps, modern arts curator at the Gemeente Museum The Hague we got a clear answer. She explained to us that the exhibition was not only consisting of the works Constant has made in the specific time of the New Babylon but also his steps towards it, for example there is a whole room dedicated to the time frame of Nieuwenhuys being a part of the Cobra movement, and another one dedicated to Constant’s research of the ‘synthesis of arts’. Mentioning all of the previous periods and having a separate space for them in the exhibition plays a very important role because that is what influences the development and new ideas and methods of working, which will eventually lead to the creation of the New Babylon project. Then alongside the artworks the curator chose to show a selection of of documentary material (pictures, collages, flyers, correspondence and films). Laura has mentioned that for her ‘Gyromorphosis’ also functions as a sort of documentary material because it is a film in which the artworks of Constant play a lead role. Hy Hirsh is the maker but the film is obviously a collaboration between the two. The way the film is made – it gives you a psychedelic, new age feel – reflects the time that it was made in very well. The curator has integrated this film (as well as other documentary material) because it gives you a feeling against what background New Babylon was created. To summarize this research, it is important to mention that the pathway of an artist is a very important factor of his work as whole. Constant Nieuwenhuys in this case, going from Cobra to the New Babylon, which stylistically are so different from each other, are still tightly connected. Collaborations with others, Hy Hirsh for example, also plays a big role in the whole process, giving it the needed documentary aspect.